Smart glass windows are also known as switchable glass, smart windows, switchable windows or E-Glass. It is made of a type of transparent glass that can turn opaque when a voltage is used. By an application of electric current, the Chromogenic materials inside the glass change the properties of light transmitted. The origin of the Smart Glass Window dates back to 3000 B.C. when the Egyptians and Sumerians made the oldest form of opaque glass. Formerly known as faience, the glass was made by simply mixing fine sand and metal oxides. The same process has been passed on to the next generation and upgraded to produced colored versions using coloring agents. In 1704, the use of electro-chromic materials was introduced. The glass changes colors when an electrical charge is applied. Though innovative, this discovery was not used for commercial purposes until 1930. It was only in 1970 when this special glass technology became popularly used in architecture, automobiles and museum displays. Today, there are different kinds glasses used in Smart Glass Windows. The Liquid-Crystal Glass, the Suspended-Particle-Device, and the Electro-chromic Glass are the modern technologies used in producing opaque windows. Smart Glass Windows is eye-catching and impressive. It enables the owner to see the entire scenery surrounding the house or building and to protect his privacy at the same time. It allows the owner to manage the light and heat that go through the windows with a simple tap on the switch. The glass blocks the light by turning translucent from transparent but at the same time maintaining gives a clear view of the outside. With this window, there is no need for shutters, blinds and curtains to keep the house secluded when needed. Using this type of window also gives more comfort, especially during the summer. 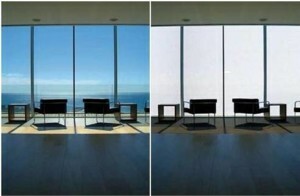 The opaque panes can repel around 95 per cent of heat and light. It is a good UV protection. This is, however, more expensive than regular glass windows. It gives savings by lowering the costs of air-conditioning, lighting, shutters, blinds, screens and curtains. Smart glass windows are also used in high-rise buildings, condominiums, display facilities, and even in hospitals. Recently, they are used in the windows of airplanes, luxury cars and in space vehicles. In choosing to use Smart Glass Windows, one must consider the kind of glass technology, the cost of installation, the cost of electricity, durability, level of transparency, dimming capacity and the rate of control. RavenBrick is a known manufacturer of Smart Glass Windows called RavenWindow. The window’s distinct feature is the use of a thermo-reflective filter technology that darkens the panes when temperature increases. There is no electricity or human effort applied in such transformation. The windows remain active or passive without the use of wires and controls. It remains transparent when cold and slightly turns reflective when hot. It thus lowers electricity, installation and maintenance costs. RavenWindow can be tailor-fitted to improve old windows, even those that have Low-E glass. It is less expensive than other brands of switch windows in the market.